In recent years, blockchain technology1 has facilitated a method by which a network of equipotent and equally privileged peers can jointly maintain and edit databases in an entirely decentralized manner, without any kind of an intermediary exhibiting unilateral control. As a consequence, blockchain technology has enabled the creation of a new type of platform architecture with distributed governance. Rather than a single intermediary constructing and governing the platform, these blockchain-enabled distributed platforms utilize internal joint revenue models to incentivize open participation in all the different platform provision functions. This has enabled the provision of similar digital platform service systems as with a single platform provider but in a completely distributed manner (see Gawer and Cusumano 2002; Boudreau and Hagiu 2008; Gawer 2009; Hagiu 2014; Hagiu and Wright 2015; van Alstyne et al. 2016, Parker et al. 2016). As the platform provision functions are opened to free market competition rather than monopolized by a single entity, the monopoly-like pricing structure typical of platforms where the platform provider captures most of the value is overhauled. Instead, blockchain-enabled distributed platforms appear to share value more evenly between all the different market sides connected to the platform: application developers, users, miners, nodes, and platform developers alike. A considerable amount of literature has been published on platforms. These studies offer various definitions for a platform.2 In the first stage of development, the terms “platform” and “product platform” were used by R&D scientists to illustrate the creation of new-generation products and services or a new product family for use as a basis for a range of product and service variants offered to customers in one-sided and two-sided markets (Gawer and Cusumano 2002; Eisenmann et al. 2006; Gawer 2009; van Alstyne et al. 2016). In the second stage of development, a school of technology researchers defined a platform as a control point and as a gatekeeper role in industrial networks used for earning revenues without actually creating value while at the same time economically damaging the network as a whole (for control point discussion, see Cusumano and Selby 1995; Cusumano and Yoffie 1998; Gawer 2009; van Alstyne et al. 2016; for gatekeeper role discussion, see Ballon 2009a, b; Ballon and Van Heesvelde 2011; Pon et al. 2014). In the third stage of development, industrial economists defined the term “platform” as a medium for conveying products, services, and related transactions—as a marketplace between two or more different market sides (Rochet and Tirole 2003, 2006; Parker and van Alstyne 2005; Boudreau and Hagiu 2008; Rysman 2009; Hagiu and Wright 2015; van Alstyne et al. 2016). Numerous definitions have been proposed for multi-sided markets over the years. One of the earliest definitions revolved around the presence of indirect network effects between two or more groups of platform participants (Katz and Shapiro 1994; Caillaud and Jullien 2003; Armstrong 2006). Another approach has been to define two-sided markets through their pricing structure. According to this view, in a multi-sided market, profits are not only affected by prices—they are also essentially affected by how the prices are allocated to different participant groups (Rochet and Tirole 2003, 2006; Parker and van Alstyne 2005; Boudreau and Hagiu 2008; Rysman 2009). Later on, Hagiu and Wright (2015) argued that a multi-sided platform is simply one which enables direct interactions between two or more market sides, each of which is somehow associated with the platform. Thus, a multi-sided platform typically comprises three kinds of elements: (1) a stable core, (2) a dynamic set of complementary assets, and (3) the design rules acting as interfaces between them. The generic idea behind platforms is that by facilitating the integration of various stable and dynamic elements in a manner carefully coordinated by the design rules, platforms can achieve a higher degree of innovative dexterity in some areas of interest while still preserving economies of scale in others (Teece 1986; Baldwin and Woodard 2009; Boudreau and Hagiu 2009; Bourdeau 2010; Parker et al. 2016). Market structures can also be described as fixed-role and switch-role markets (Aspers 2008). Subsequently, the concept of a platform was extended to include social, primarily contractual boundary resources as well as technical boundary resources (Gawer 2009; Eisemann 2008; Bourdeau 2010; Yoo et al. 2010; Ghazawneh and Henfridsson 2013). Additionally, reference should be made to the research on technology platforms initiated in the 1990s as well as compatible and competing standards (Cusumano and Selby 1995; Kim and Kogut 1996; Cusumano and Yoffie 1998) and to the research on platform governance (Schilling 2005; Tiwana et al. 2010; Tiwana 2014). Schilling (2005) defines platform governance as “the mechanisms through which a platform owner exerts influence over app developers participating in a platform’s ecosystem.” Boudreau and Hagiu (2009) analogize platforms to public regulators, with the exceptions that platforms typically regulate with an interest of maximizing profit by controlling prices, access, and interactions on the platform and that they usually exhibit regulatory behavior in the domain of technical design, system architecture, and technical relationships. Moreover, Parker and Van Alstyne (2014) define governance as the set of rules concerning who gets to participate in an ecosystem, how to divide the value, and how to resolve conflicts. On a general level, the prevalent definitions of platform governance refer to the interaction between the platform provider and any agents who contribute to the service offering of the platform externally, from outside of the platform itself. While such external governance remains very relevant for research, in order to fully describe blockchain-enabled distributed platforms, the definition of platform governance must be expanded to include the mechanisms of internal governance; these are the mechanisms through which the providers of a multi-provider platform exert influence over other providers participating in the provision of the same platform (Schilling 2005; Tiwana et al. 2010; Tiwana 2014). Parker et al. (2016) and de Reuver et al. (2017) propose that further studies on platform governance may yet provide answers to some of the open questions in platform literature, e.g., how to design balanced internal governance systems in multi-sided platforms to ensure fair operation. The internal governance structures in blockchain-enabled distributed platforms have not yet been thoroughly explored in the context of this open question in the multi-sided platform literature. By performing a case study on the most prominent blockchain-enabled distributed platform in existence—namely, the Bitcoin cryptocurrency network—this chapter makes an effort to determine whether blockchain architectures can constitute multi-sided platforms as delineated in the platform literature. The motivation for this analysis is to determine whether blockchain architectures are relevant to this open research question regarding more balanced internal governance systems in multi-sided platforms. Having established that these systems are indeed relevant, we then proceed to describe how the internal governance structure is organized in these new kinds of distributed platforms. To what extent is the concept of multi-sided platforms, as delineated in platform literature, compatible with blockchain architectures? What kinds of platform governance structures do blockchain architectures exhibit when observed through this framework of multi-sided platforms? What are the potential wider implications of blockchain governance structures on multi-sided platforms research? Our analysis reveals that blockchain architectures add new considerations to how multi-sided platforms should be perceived. Firstly, in blockchain-enabled distributed platforms, not only have the product and service innovations pertaining to the platform been externalized, but the entire platform provision has been distributed across various market sides. Therefore, blockchain-enabled distributed platforms introduce new categories of interaction between platform participants. Secondly, blockchain-enabled distributed platforms introduce new models of platform governance. Furthermore, as no formal decision-making protocols are in place, an informal negotiation process takes place involving a scheme of theoretical attacks and countermeasures used as bargaining chips against other market sides. Thirdly, blockchain-enabled distributed platforms seem to have introduced a new method of platform monetization. Much like contemporary multi-sided platforms, blockchain-enabled distributed platforms also employ split revenue schemes but in a more equilateral manner and without monopolistic pricing structures. The remainder of this chapter continues as follows. The second section explains the methodology of the study. The next section describes platform characteristics and the internal governance structure of blockchain-enabled distributed platform mechanism in the light of platform literature. The fourth section presents the findings of the research focusing on the following two key themes: (1) if blockchain-enabled distributed platforms meet the criteria of a multi-sided platform and (2) the applicability of Tiwana’s (2014) framework on platform governance. We conclude this chapter with a short discussion on the implications for future research. The theoretical positioning of this research is mainly conceptual in nature. In academic literature, conceptual papers are ones quintessentially characterized by an integrational approach. Rather than emphasizing empirics, conceptual papers tend to fixate on providing cross-disciplinary insights and bridging theories. While the focus of conceptual research is typically much narrower in scope than that of theory-building research, a well-drafted conceptual paper may also contribute to theory by pointing out interesting relationships, improving theoretical coherence, and proposing new directions and perspectives for further research (Gilson and Goldberg 2015; Sutton and Staw 1995). The chosen methodology for this study is a case study design. Case studies can be utilized for several different purposes, e.g., to test existing theories, to generate new ones, or simply to describe phenomena (Eisenhardt 1989). As its case of analysis, this paper examines the most prominent blockchain architecture in existence at this time: the Bitcoin cryptocurrency network. In the first part, we test the applicability of the multi-sided platform theory to blockchain architectures by superimposing the conceptual framework of multi-sided platforms onto the Bitcoin network. The second part of the analysis makes an effort to describe the phenomenon of internal and external governance in blockchain architectures from the perspective of multi-sided platforms. The governance mechanisms are delineated by using the classification of Tiwana (2014) on platform governance as a framework. In addition to literary references, the technical understanding on blockchain technology in this chapter also draws from nondirective interviews with industry experts from companies such as IBM, BitPay, Blockstream, Vaultoro, Colu, Bitreserve, Google, 21, Stellar, Monax, Ascribe, Prasos, and Fortum in 2015–2017. In economics, a network effect describes a situation in which the value that a user gets from using a system depends on how many other participants the system has. This dependency can be either positive or negative. Direct network effects occur when increased use of a product or a service benefits or harms the users of that particular product or service. In the online gaming community, for example, players experience direct network effects from additional players joining the gaming environment. Indirect network effects are in question when increased use of a product or a service benefits or harms the users of a different product or service. To follow with the earlier example, in the online gaming community, the players benefit indirectly from the presence of game developers participating in the community and vice versa (Katz and Shapiro 1994; Caillaud and Jullien 2003; Armstrong 2006). In platform literature, network effects have been mentioned as one of the key characteristics of multi-sided platforms. Likewise, blockchain-based distributed platforms also live and die by network effects. In fact, the successful fostering of network effects is even more important in blockchain-enabled distributed platforms than in other platform types, because the security and the technical functionality of the platform are to a large extent based on them (see Nakamoto 2008). The robustness of a blockchain network typically grows stronger with every additional miner and node, thus fortifying the network against malevolent attacks that, if successful, could ultimately render the entire platform useless (Nakamoto 2008; Laszka et al. 2015; Yli-Huumo et al. 2016). As this makes the platform more stable and safer to operate, the logical consequence is the attraction of more users to join the platform (see, e.g., Vasek et al. 2014). Respectively, increased user activity makes the platform financially more appealing to miners and application providers, as more paying customers translates into more opportunities for business and profit (Kroll et al. 2013; see also Alabi 2017). Similarly, a higher number of application providers can be postulated to draw more platform developers to the platform, as this translates to better funding opportunities (van Wirdum 2016). The addition of more developers, in turn, increases usability and security, thus likely attracting more users, miners, application providers, and so on (see, e.g., Alabi 2017). In platform literature, one characterization of multi-sided platforms is that they operate in two-sided—or more generally speaking, multi-sided markets. A market is said to be multi-sided if more than one market side is crucial to the outcomes of interest and the market sides exhibit network-effect-like externalities between them (Rochet and Tirole 2003; Parker and van Alstyne 2005; Rochet and Tirole 2006; Eisenmann et al. 2006; Boudreau and Hagiu 2008; Rysman 2009; Hagiu 2014; Hagiu and Wright 2015; van Alstyne et al. 2016). Blockchain-based distributed platforms emerge from the collaboration of several different types of actors. This collaboration can be described as a multi-sided market where some of the market sides are platform providers and some of them are platform users. In the Bitcoin platform, five market sides can be distinguished: the users, the application providers, the miners, the nodes, and the platform developers. Users are the actors whose main motive for participating in the distributed platform is to make use of its practical functionality. Users may be looking to transfer funds over the Internet, for example. Alternatively, they may be interested in acquiring some of the cryptocurrency tokens native to the platform with the intent to hold them as an investment for financial gain. 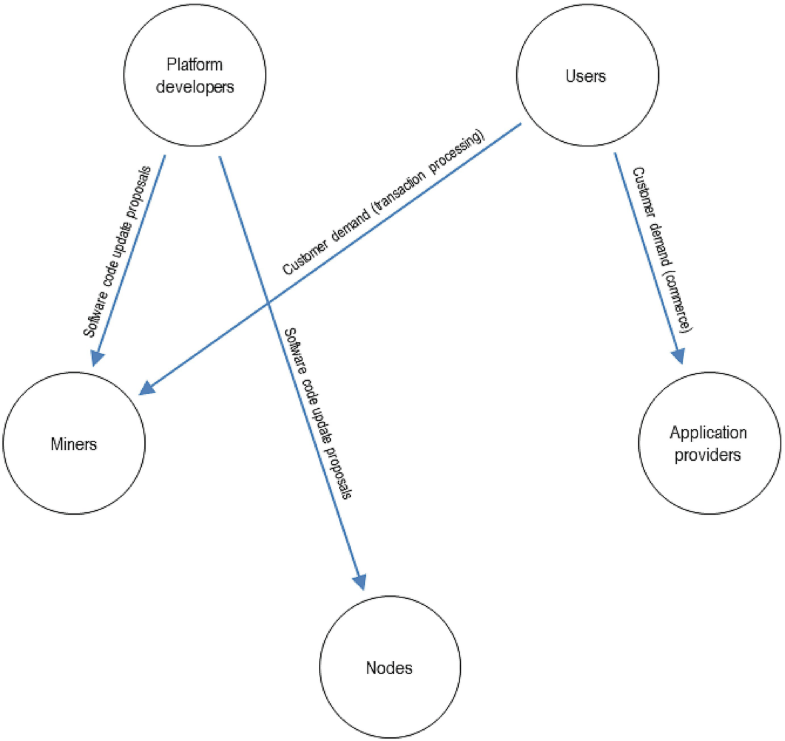 Users can access the platform either by going through the services of application providers or by setting up their own node (see below) and connecting it to the network (Athey et al. 2016). Application providers participate in the distributed platform by building products and services on top of it which extend the functionality and the usability of the underlying platform. In doing so, the application providers introduce complementarities which further enhance the network effects of the platform. Most often the application providers monetize their business by charging service fees from the users. Wallet service providers and cryptocurrency exchange services, for example, fall into this category (Athey et al. 2016). Miners are essential to the operation of the network. They handle the data entries and the transactions between the users of the platform and provide security by partaking in the consensus-forming process of the network. By constantly solving concatenated mathematical problems in a cryptographic process known as hashing, the miners produce proof of work: a testimony to the fact that the content of the distributed database is authentic. As the hashing process consumes CPU power, the miners are incentivized to partake in the process by issuing them new cryptocurrency as mining rewards, as well as transaction fees charged from the users (Böhme et al. 2015; Gasser et al. 2015; Filippi and Loveluck 2016; Dimitri 2017). Nodes are the computers/software clients which form the actual blockchain network. Each one of them individually maintains the distributed database which underlies the distributed platform. The nodes are also in charge of enforcing the consensus rules of the network by validating and propagating the new blocks produced by the miners for the blockchain. Each node operates autonomously, irrespective of other nodes or platform participants. Nodes can either be full nodes or simplified payment verification (SPV) nodes. Each full node maintains a full copy of the entire blockchain, making them the backbone of trustless security in the network. SPV nodes only store block headers, making them less independent but much lighter to run (Nakamoto 2008; Cawrey 2014; Filippi and Loveluck 2016). Platform developers work on the technical design of the Bitcoin protocol. They formulate and propose adjustments to the technical and social boundary resources that govern the interactions that take place on the platform. Early stage developers can monetize their development efforts by holding an initial investment of tokens within the platform. As the amount of activity on the platform increases, so does the demand for the tokens, consequently driving up their purchasing power. At later stages, platform developers can also be supported directly by consortiums of large-scale application developers (Filippi and Loveluck 2016; van Wirdum 2016). In platform literature, the presence of complementarities has been considered one key characteristic of multi-sided platforms. Goods and services are said to be complementary to one another if the utility offered by one greatly depends on the consumption of the other. One classic example of a complementarity is the relationship between a rowing boat and a pair of oars: these assets offer much higher utility when used together compared to when using them separately (for more information on complementary assets, see the seminal work of Teece 1986, 1988; Yoffie and Kwak 2006; Dahlander and Wallin 2006; Gawer and Henderson 2007). The complementarities in blockchain-enabled distributed platforms do not only manifest themselves in the external goods and services attached to the platform but also internally within the platform itself. As blockchain-enabled distributed platforms do not have a distinct platform owner, they require the collaboration of various market sides to produce all the necessary platform provision functions (Filippi and Loveluck 2016). This collaboration can only produce a functional distributed platform if all the required provision functions are addressed. In platform literature, boundary resources are the operational regulations and technical tools and interfaces governing the interaction between the platform owner and the platform participants. They can be used either to encourage platform development or to restrict it in places where the platform owner wishes to maintain control over the developmental direction of the platform. These resources are sometimes divided into technical and social boundary resources (Gawer 2009; Bourdeau 2010; Yoo et al. 2010; Ghazawneh and Henfridsson 2013). Technical boundary resources govern the technical interactions between platform participants. In distributed platforms they manifest themselves in the operational principles of the distributed consensus network which underlies the platform. These boundary resources define operational features, such as how the nodes of the network connect and communicate to one another, what kind of a consensus protocol is employed by the network, and what are the prerequisites for partaking in the platform provision functions (Nakamoto 2008). Social boundary resources manifest themselves as the predetermined framework for social interaction on the platform, e.g., prespecified terms of agreement for application developers, or revenue split models between participants (Gawer 2009). In distributed platforms, the social boundary resources consist of the business and contract rules governing the content of the distributed database that the distributed consensus network maintains. These rules define what kinds of modifications can be done to the database, by whom and in what manner. For example, in cryptocurrency platforms, users are typically not allowed to make payments that would exceed their account balance (see, e.g., Filippi and Loveluck 2016). The social boundary resources of blockchain-enabled distributed platforms also outline the joint monetization models, e.g., how the mining rewards are added to the total money supply of the platform. It is noteworthy, however, that in blockchain-enabled distributed platforms, these split-revenue schemes are algorithmically governed, rather than decided by a platform owner (Dimitri 2017; Böhme et al. 2015). It seems to be the case then that blockchain-enabled distributed platforms bring some of the boundary resources formerly considered more social in nature into a more technical domain. Contemporary platforms are also differentiated from blockchain-enabled distributed platforms by the fact that whereas the former are provided by one party, distributed platforms, by definition, have multiple equipotent and equally privileged platform providers. Therefore, distributed platforms also have a completely new area where boundary resources apply: the internal interactions between one platform provider and another platform provider. These inter-provider boundary resources include many familiar ones, such as APIs, SDKs, and technical documentations, but also some completely new ones, such as a consensus protocols and the algorithmically defined game-theoretical incentivization structures mentioned above (Nakamoto 2008). Tiwana (2014) divides decision rights into two dimensions, with two categories each: (1) platform decision rights vs. application decision rights and (2) strategic decision rights vs. implementation decision rights. Platform decision rights pertain to decisions relating to the platform, whereas application decision rights pertain to decisions relating to the complementary assets of the platform. Strategic decision rights refer to the right to determine what the platform or a complementary asset should be able to achieve, while implementation decision rights are related to determining how those goals should be accomplished. Tiwana (2014) measures these four categories of decision rights on a gradient scale from full centralization to full decentralization. Baran (1964), however, differentiates between three configurations for communications networks: centralized, decentralized, and distributed. In order to more accurately describe the allocation of decision rights in blockchain-enabled distributed platforms, this paper expands Tiwana’s (2014) gradient scale accordingly to include these three configurations (Fig. 1). The problem with trying to establish joint platform strategic decision-making processes for blockchain-enabled distributed platforms (e.g., democratic voting) is that there is no clear and objective way to measure the support for a strategy among all the different platform providers and participants. Moreover, no single faction or individual has the power to dictate platform strategy on their own without sufficient support from the others (Filippi and Loveluck 2016; Gasser et al. 2015; Kroll et al. 2013). Therefore, the different market sides must communicate with one another to negotiate strategic platform decisions and their implementations, despite the fact that no structured forum or protocol exists for such negotiations at this point in time. So, in theory, Bitcoin is anarchistic in governance, as no single platform owner is in control of the system and no formal mechanisms of multi-party decision-making are in place. A more detailed examination, however, reveals that some de facto structure exists regarding how platform decision rights are allocated within the system (Kroll et al. 2013; Gasser et al. 2015; Filippi and Loveluck 2016). For example, miners and nodes can signal their support by running different client versions, and developers can signal their support by committing to different development projects (Gasser et al. 2015; Srinivasan and Leland 2017). It has been speculated by some that more formal protocols for strategic platform decision-making may be seen in the future. For example, anonymous cryptocurrency-based voting mechanisms may be considered for measuring how much support different planned strategies have in the platform ecosystem (Consensus 2017). 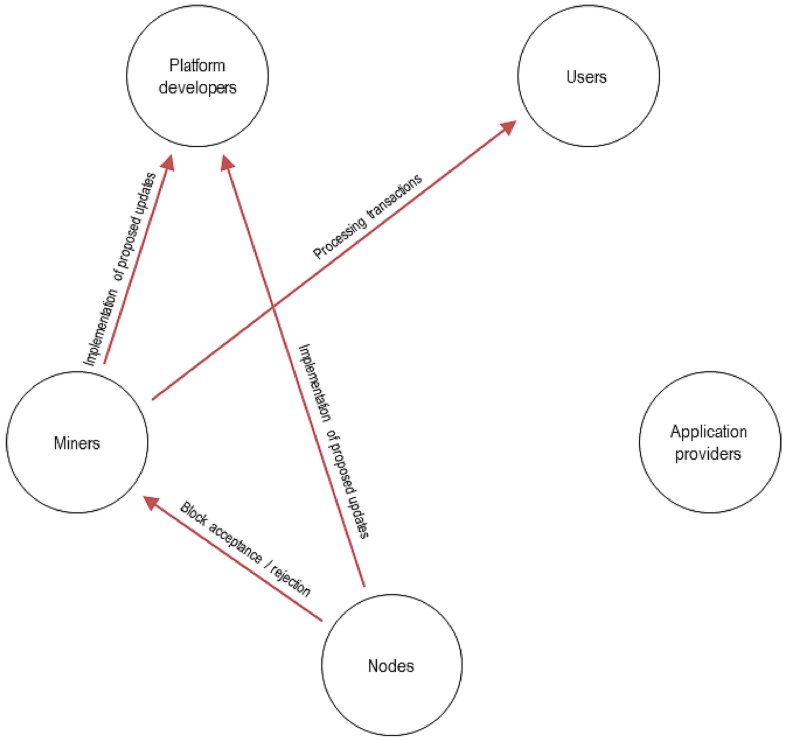 The platform implementation decisions in Bitcoin are decentralized rather than distributed in nature, as in practice the platform developer communities have great preeminence in what kinds of implementation proposals are brought forward in the platform ecosystem (Kroll et al. 2013; Gasser et al. 2015). It is mainly up to the miners and the nodes to decide which proposals are accepted—other parties’ decision rights in this respect are mostly manifested in their ability to affect the decision-making of the aforementioned two market sides (Kroll et al. 2013; Atzori 2015; Filippi and Loveluck 2016). As Bitcoin is based on a permissionless blockchain architecture, no permission is required from any party to become a part of the network (Filippi and Loveluck 2016). Therefore, application-related decision rights are completely distributed across the individual application providers and their respective developers. Output control, or metrics, refers to the mechanisms of rewarding or penalizing the platform participants on the basis of their performance against some pre-defined target performance metrics (Ouchi 1979; Tiwana 2014). In modern day platforms, explicit forms of output control are somewhat rare, as most platforms simply maintain one output criterion: the survival and success of their complementary assets in the free market competition environment (Armstrong 2006; Bester and Krähmer 2008). 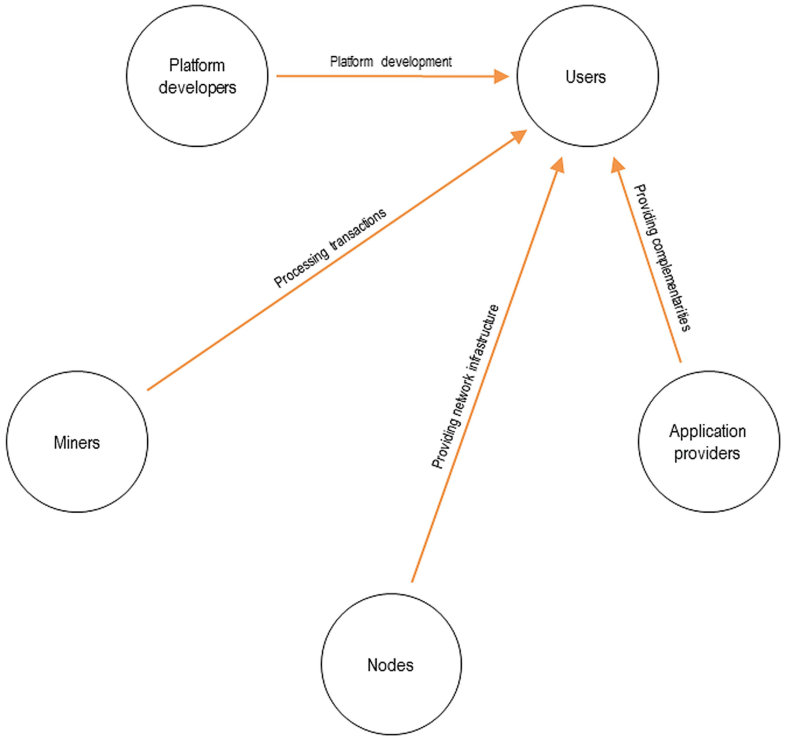 In Bitcoin, output control is mainly exercised by users and platform developers (see Picture 1). While the platform developers cannot force anyone to run their software, they can make proposals for new source code implementations. Blockchain-enabled distributed platforms rely on open source code. Therefore, in theory, anyone could write and implement their own version of the code, as long as it adheres to the consensus protocol of the network (Gasser et al. 2015; Filippi and Loveluck 2016). In practice, however, most if not all of the seriously considered suggestions for new source code implementations tend to come from the Bitcoin developer community. Therefore, the developer community has a great amount of control over what kinds of source code modifications are suggested to the network and what kinds of performance metrics and reward schemes they entail (Kroll et al. 2013; Atzori 2015; Gasser et al. 2015; Filippi and Loveluck 2016). The source code designed by the platform developers dictates what kind of a consensus algorithm the network uses to maintain integrity and how the mining incentives are configured (Kroll et al. 2013; Gasser et al. 2015; Filippi and Loveluck 2016). As the profitability of the miners’ business operations crucially depend on these factors, the platform developers have some output control over the miners (Torpey 2016a, b). The nodes also run the code designed by the platform developers, and therefore they are also subject to the output control, even if they are not so crucially dependent on the decisions made (Gasser et al. 2015). When the platform developers write new versions of the network’s client software, they can propose three kinds of alterations: ones that add new consensus rules to the network (soft forks), ones that remove or replace old consensus rules from the network (hard forks), and ones that do not affect the consensus protocols one way or the other. The more drastic the proposed changes to the consensus rules are, the more difficult it is to get them approved (Croman et al. 2016). The users exercise output control over the miners in the sense that they provide the demand and the free market competition environment for the miners’ services. A miner must be able to perform a competitive amount of computational work for a set market price in order to turn a profit. Input control, or gate-keeping, is the enforcement of some pre-defined, objective criteria as a prerequisite for granting entry into the platform ecosystem. Typically the term has been used in reference to the platform owner exercising control over what kinds of application developers it allows into its cohort of complementary asset providers (Cardinal 2001; Evans et al. 2006; Boudreau 2010; Tiwana 2014). While no such control exists in the Bitcoin platform in this sense (Parker et al. 2016), input control is at play within the internal governance mechanics of the Bitcoin network itself. The input control in Bitcoin is mainly exercised by the miners and the nodes, both of whom run the software developed by the platform developers (see Picture 2). As miners and nodes are free to decide which versions of the platform software they want to use, they are very influential as groups in determining what development features are accepted as a part of the platform and which ones are not (Kroll et al. 2013; Atzori 2015; Filippi and Loveluck 2016). The miners also have input control toward users in the sense that they have the power to decide which pending transactions are entered into the blockchain and which ones are not (Dimitri 2017). This form of control also has some characteristics of output control. The miners are limited in their capacity to add transactions into the blockchain by the block size specified in the consensus rules of the network. As the pending transactions have tips called transaction fees attached to them by the users, the miners have an incentive to attach the highest bidding transactions to the blocks first (Dimitri 2017; Kroll et al. 2013; Catalini and Gans 2016). This creates a free market competition environment where the users must provide adequate compensation for the service of the miners in order to have their service request fulfilled over other service requests. Another form of input control in Bitcoin is that exercised by the nodes over the miners. As the nodes are effectively in charge of enforcing the consensus protocol of the network, they as a group have the power to decide which blocks proposed by the miners are accepted as a new part of the blockchain and which ones are rejected. Process control pertains to rewarding and/or penalizing application developers for following prescribed methods and procedures of development. This can be so as to ensure interoperability with the rest of the platform, for example (Tiwana 2014). 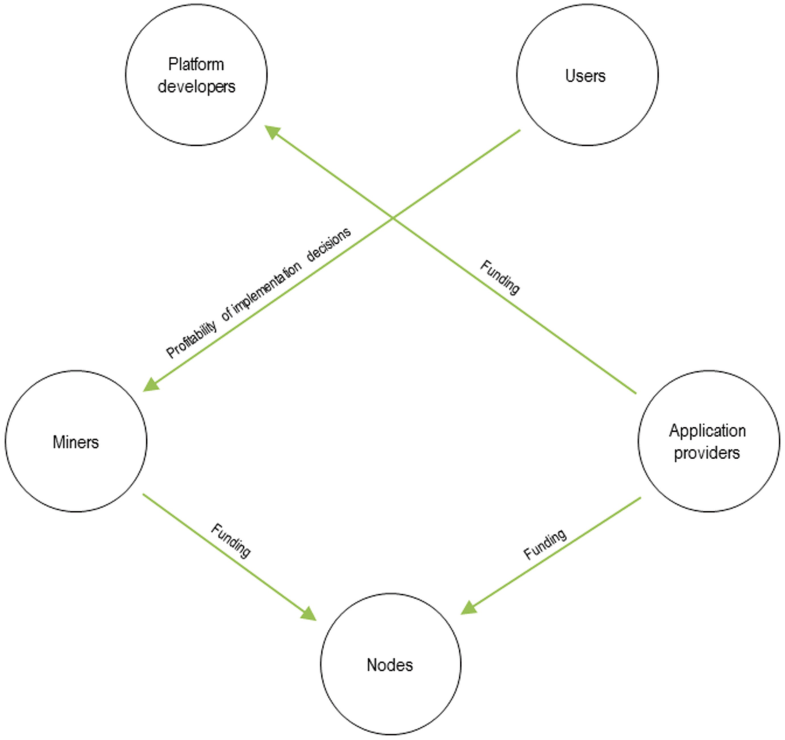 Process control is exercised in the Bitcoin network by users, application providers, and to some extent also miners (see Picture 3). The platform developer community receives funding for their work from the application providers who have built their businesses on top of the Bitcoin platform and therefore depend on its development. This gives application providers some leverage over platform developers in determining what kinds of features should be incorporated into the source code and how the development should take place. The same kind of a situation applies to nodes. Nodes are not compensated for their efforts through revenue split models in the same way as miners are, so they depend entirely on the good will of their respective owners to be set up and to have their operational costs covered. For this reason, the most reliable nodes of the network are usually maintained by parties who have the strongest vested interest to pay for them—that is, the market sides with the strongest ability to profit directly from participating in the platform: the application providers and miners (see Hagiu 2014). This gives them some degree of process control over what kinds of software updates the nodes will support, for example. Perhaps the strongest position of process control, however, is held by the users over the miners. The motivation of the miners for participating in the platform is to make profit through transaction fees and block rewards, both paid out in the cryptocurrency tokens native to the platform. As stated above, the miners and the nodes have input control over the platform developers in deciding which software updates get implemented. However, if the miners choose to implement software code alterations that are not to the liking of the users, they will sell off their cryptocurrency tokens, lowering the exchange rate of the cryptocurrency, which in turn will directly affect the mining profitability (Athey et al. 2016). The same process control mechanism also discourages minorities of the miners from implementing consensus-breaking software updates, or so-called hard forks, which would fragment the network into a larger number of smaller networks (Reijers et al. 2016). Relational control or clan control manifests itself in the shared norms and values held by the platform participants (Ouchi 1979; Kirsch 1997; Tiwana 2014). The cryptocurrency tokens used in blockchain-enabled platforms provide a strong mechanism for relational control (see Picture 4). They can be freely exchanged with conventional currencies and thus acquired by anyone who so pleases (Athey et al. 2016). The cryptocurrency serves as a medium of internal and external cooperation in the platform ecosystem, and it facilitates the incentivization of various participants by enabling a split revenue model for open participation (Catalini and Gans 2016; Böhme et al. 2015). The velocity (V) at which cryptocurrency tokens circulate in the ecosystem is limited by two factors: the average transaction value and the transaction throughput capacity of the network. The average transaction value is dictated by the types of financial activity within the platform ecosystem. Therefore, unless major changes occur in the ways and in the purpose for which the platform is utilized, the average transaction value can be expected to remain relatively stable. Blockchain ledgers usually rely on a method where a new standard-sized block is added to a blockchain at more or less frequent intervals. While the throughput can be increased by a majority decision among the participants to increase the block size, under normal operating conditions, the capacity can be assumed to be fixed. As financial activity on the platform (q) increases, it then follows from these assumptions that the only way for the equation to hold true is if the price level (p) decreases—that is, the value represented by each token must rise. Through this dependency and its projected growth development, the cryptocurrency tokens provide an investment vehicle which reflects the amount of activity on the platform ecosystem as directly monetizable value. Therefore, anyone in possession of these cryptocurrency tokens will find their goals and values aligned toward fostering the growth and the network effects of the platform ecosystem as much as possible (Alabi 2017; Catalini and Gans 2016; Athey et al. 2016). Since blockchain-enabled distributed platforms do not have a centralized platform provider, they are not prone to monopoly behavior with their pricing policies, as is often the case with contemporary platforms (Parker et al. 2016). The Bitcoin cryptocurrency platform uses revenue split schemes to incentivize collaboration among the platform providers. Partially these revenue splits are determined by free market competition within the market sides engaged in platform provision. Some revenue splits are determined algorithmically in the source code and the consensus protocols of the network. As mentioned earlier, maintaining consensus in blockchain architectures requires miners to produce a proof-of-work. This can be characterized as a cryptographic testimony to the fact that the blockchain maintained by the network is authentic. As producing the cryptography required for the testimony requires computational work, miners typically receive compensations for sacrificing electricity for the good of the network. These compensations are commonly referred to as mining rewards or block rewards (Dimitri 2017; Böhme et al. 2015). Mining rewards are the most prominent form of revenue splitting in blockchain architectures. The rewards are issued by minting new cryptocurrency into the system at frequent intervals. This increases the total supply of tokens which—according to the quantity theory of money—reduces the value of each token respectively (see section “Control”). Thus, the mining rewards somewhat resemble algorithmic seigniorage—an inflation tax collected from all platform participants and used to subsidize the production of public goods—namely, distributed consensus and immutability of record (Athey et al. 2016; Catalini and Gans 2016). Miners also typically receive another form of compensation for their efforts. When a user wishes to make a transaction through the platform, they can add a voluntary transaction fee to their request. As the miners are limited in their capacity to add transactions to the blockchain due to the fixed block size and proof-of-work requirements, the transaction fees serve to ensure that the miners are incentivized to handle the transactions in an expedited manner. As most transactions have fees of some quantity attached to them by the users, the size of the transaction fee required for a normal throughput is determined by free market competition between the transaction requests (Dimitri 2017). Unlike the miners, the platform developers and the nodes are not compensated for their platform provision functions through inflationary taxes and transaction tips (Filippi and Loveluck 2016). Instead, in order to get compensated, they must rely on a third form of revenue splitting quintessential to blockchain platforms: token investments, as described in section “Control”. In this paper, blockchain architectures were analyzed with the intent to determine whether they constitute multi-sided platforms. The paper also made an effort to delineate the internal governance structure of blockchain-enabled distributed platforms. This analysis was performed by applying Tiwana’s (2014) framework on platform governance to the case examination of the Bitcoin cryptocurrency network. On the basis of the case analysis of the Bitcoin cryptocurrency, blockchain architectures can clearly exhibit all the characteristics of a multi-sided platform, as outlined in the platform literature. The case architecture demonstrates direct network effects, as well as cross-side externalities. The interactions around the examined system can be described as multi-sided switch-role markets, and the technical and social boundary resources of these architectures are clearly defined. Some discrepancies were observed, however, in regards to the wider perceptions of platforms in the platform literature. While blockchain-based distributed platforms coordinate and regulate the connections between its ecosystem participants (Gawer and Cusumano 2002), they do not necessarily function as licensing authorities, as characterized by Rochet and Tirole (2003). To a certain degree, distributed platforms serve the role of a public interest regulator but do not exhibit the characteristics of a monopolist platform owner, as described by Boudreau and Hagiu (2008). Several conclusions can be drawn from the case analysis in section “Mechanisms of Internal Governance”. Firstly, in blockchain-enabled distributed platforms, not only have the product and service innovations pertaining to the platform been externalized, but the entire platform provision has been distributed across various market sides. In the examined case example of Bitcoin cryptocurrency, the distributed collaboration is held together by an intricate web of monetary incentives and different forms of interlocking control mechanisms exerted by the participating market sides toward one another. Secondly, although Bitcoin is technically anarchistic in governance, some de facto structure exists to how the platform decision rights are allocated in Bitcoin. As no formal decision-making protocols are in place, an informal negotiation process takes place through various forms of indirect signaling. Thirdly, blockchain-enabled distributed platforms seem to have introduced a new method of platform monetization. The contemporary platform business models have mainly been based on enabling direct interactions between the different market sides and monetizing by controlling access to those interactions and by leveraging information asymmetries. In blockchain-enabled distributed platforms, however, the linchpin business model seems to revolve around launching an independent, self-sustained open ecosystem of direct interactions and monetizing on the tokens of value utilized as the means of exchange in that ecosystem. Fourthly, much like contemporary multi-sided platforms, blockchain-enabled distributed platforms also seem to employ split revenue schemes, with two notable differences in regard to conventional multi-sided platforms. The first difference is that in Bitcoin, the revenue splits are not used to share profits between external complementary asset providers and the platform’s owner but between all the different market sides participating in the platform provision and the ecosystem at large. The second difference is that the platform pricing and the split revenue schemes are not monopolized by any single party but rather determined by the quasi-anarchistic, semi-structured decision-making process between the market sides, as well as free market competition mechanics. 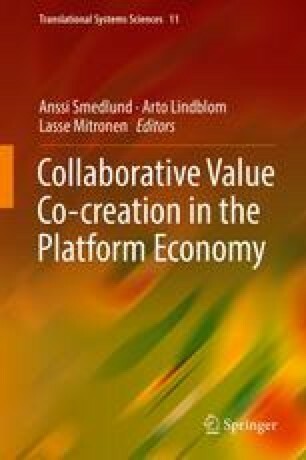 Boudreau and Hagiu (2008) have hypothesized that all the coordination problems related to the collaboration around multi-sided platforms cannot be solved through mere price-setting alone. In contemporary platforms, the economic incentivization only prevents market failures to the extent that the platform participants are compensated for their participation through revenue split models. In blockchain-enabled distributed platforms, however, the economic incentivization is more equilateral and ubiquitous than in contemporary platform models. Therefore, we argue that the variety of coordination problems and market failures that can be addressed through price setting is quite likely to be much wider in scope in distributed platforms (see Catalini and Gans 2016). For this chapter, we define blockchain technology as the cryptographically concatenated data structure and network architecture described by Nakamoto (2008) which entails a proof-of-work consensus protocol and employs cryptographic tokens of value, more commonly referred to as cryptocurrency. In this chapter, we use the term platform in reference to a system that allows the various actors—users, providers, and other stakeholders across organizational boundaries—to engage in value-adding activities. It is typical of platforms in this sense that the individual actors create, offer, and maintain mutually complementary products and services for various distribution channels and multi-sided markets within the framework of common business and contract rules, governance, and user experiences. A typical characteristic of a platform is to attract and lock in a range of actors keen to harness the economic benefits offered by direct and indirect network effects. It should be noted that some similar types of categorizations have been drafted before in literature regarding Bitcoin’s governance. For example, Filippi and Loveluck (2016) divide the governance of Bitcoin into two categories: “governance by the infrastructure” (i.e., the Bitcoin protocol managing the community) and “governance of the infrastructure” (i.e., the community managing the protocol). From the multi-sided platforms’ perspective, the former bears great similarity to the concept of boundary resources (see section “Boundary Resources”) and pricing policies (see section “Pricing Policies”), while the latter rather resembles the concept of platform decision rights (see section “Decision Rights”). The categorizations are not directly interchangeable, however, as the control category in Tiwana’s framework (see section “Control”) seems to incorporate aspects of both of Filippi’s and Loveluck’s categories simultaneously. Respectively, Gasser et al. (2015), speaks of “the power of influencing the normative content of the rules” and “their social realization” in Bitcoin. In this vernacular, the first half, again, relates to Tiwana’s concept of decision rights, while the social realization somewhat equates to Tiwana’s notion of control. However, in the context of platform literature, so far, there has been little in the way of detailed conceptualizations of blockchain governance mechanisms. It should also be acknowledged that many of the market sides specified in this paper contain several factions which are engaged in internal power struggles within the market sides. For example, developers have mostly organized themselves into rival developer communities, miners have diversified their risks by forming collective mining pools which compete against one another, and so on. (Böhme et al. 2015) However, the scope of this research does not permit us to delve deeper into these internal power struggles, as our main focus is on the power relations and the power mechanics between the different market sides. For example, the first and most widespread blockchain platform to date, the Bitcoin network, uses native tokens called “bitcoins,” each divisible to 100 million “satoshis.” The source code of the system is set up in such a way that minting new bitcoins becomes exponentially more difficult as time passes on. This way, the maximum number of bitcoins that can exist in the system is limited to 21 million by the current consensus protocol. This paper has been drafted as a part of the Work and Wealth in the Era of Digital Platforms (BRIE-ETLA) research collaboration of 2015–2018. Timo Seppälä has also received financial support for his work from the Blockchains Boosting Finnish Industry (BOND) research project. de Reuver, M., Sørensen, C., & Basole, R. C. (2017). The digital platform: A research agenda. Journal of Information Technology. https://link.springer.com/journal/41265/onlineFirst/page/1.